There's no better way to celebrate a New Orleans wedding than to have a second line parade through the French Quarter. 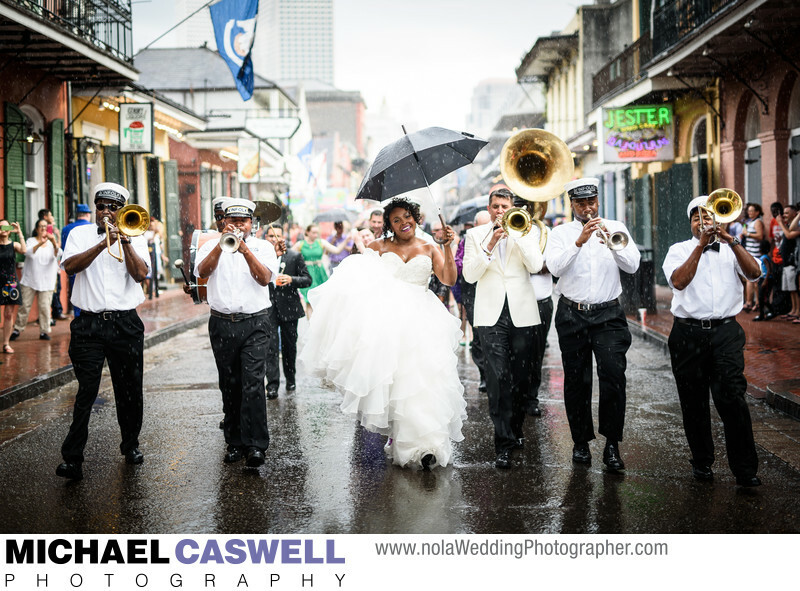 Led by an authentic brass band, such as the fabulous Kinfolk Brass Band shown here (without question the most popular and prolific wedding second line band in the city), the bride and groom pump parasols or umbrellas up and down as guests wave handkerchiefs and crowds of tourists cheer the group on from the sidewalks and balconies. The parade can be scheduled to take place either between the ceremony and reception as this one was, or at the conclusion of the reception. Can't Rain on This Bride's Parade! Just as we were departing the Maison Dupuy Hotel on Toulouse Street for this particular parade, a light rain started to fall, but we continued anyway. The rain became a bit heavier, but even that didn't stop us! While I'm sure the bride would have greatly preferred to have had perfect weather on her wedding day, I love the spirit that this photograph perfectly captures: a resilient and fun-loving couple and group of guests who were not about to let a little rain get in the way of their celebration, and devoted musicians who persevered through the bad weather instead of insisting that the parade be canceled and just fulfilling their obligation by playing inside the venue for a little while. Despite the unpleasant conditions, I did not want to miss the opportunity to capture these wonderful images for my couple, and continued to shoot. While it was not enjoyable working in wet clothes for the rest of the evening, it certainly was worth it for this amazing sequence of pictures! Another unique aspect of this image was the trombonist who is marching next to the bride... that's the groom! He was a musician when he served in the military, and the awesome members of the Kinfolk Brass Band were cool enough to let him join in and play along with them as they made their way through the streets of the Vieux Carré.